Wildberry and peach? Where have you been all my life? It’s not like those flavors are unique to the UK , so what gives? I like the color scheme too, although it looks more like it would be blueberry, cause…it’s blue. For some reason the colors just do it for me on these. So extremely fake, so extremely unnatural. Ideal! The wild berry though, is a bit of a disappointment. Like other “berry” flavored candy, it just tastes red to me. Sweet, slightly tart….”berry” flavor. I have to rant briefly about this. Why make a flavor “wild berry”? Or “triple berry”? Or even “Berry”? Why not make it the actual name of one, real, berry? When candy makers do this, it feels like a super cop out to me. It certainly cannot be the case that they’re actually combining the essence of three unique berries-no way. That requires effort. I’m convinced that they have a generic berry flavor that they drop this or that in, and then call it a spinoff berry name. “Passion Berry”. “Tropical Berry”. “Extreme Berry”. “Wildberry”. You get the idea. So we’re all clear that I wasn’t nutty about the wild berry. The peach though, is a delight. 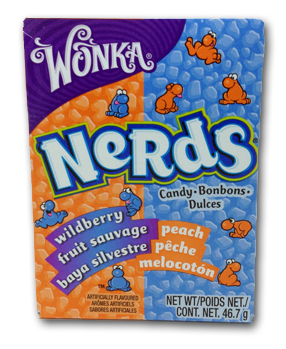 Very peachy, very tart, a great flavor addition to the Nerds family. I don’t think I’d go out of my way to buy these again, but if I saw them…I might. Who knows, maybe someday they’ll come to this side of the pond. Until then, if you really want to try them- you can! Click the link below to get your mits on them. 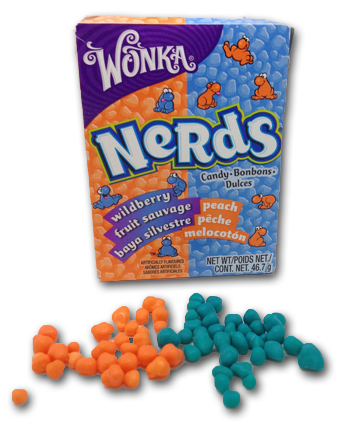 Spineless bunch, us candy developers.